The basketball score board contains a space which includes many details of the game. These details include a roster, player statistics, fouls and free throws. This scoreboard can easily track the current score for both the teams involved in the game. It really makes it easy for the minor details to be recorded smoothly. You can also see Scoreboard Templates in Microsoft Word Format. 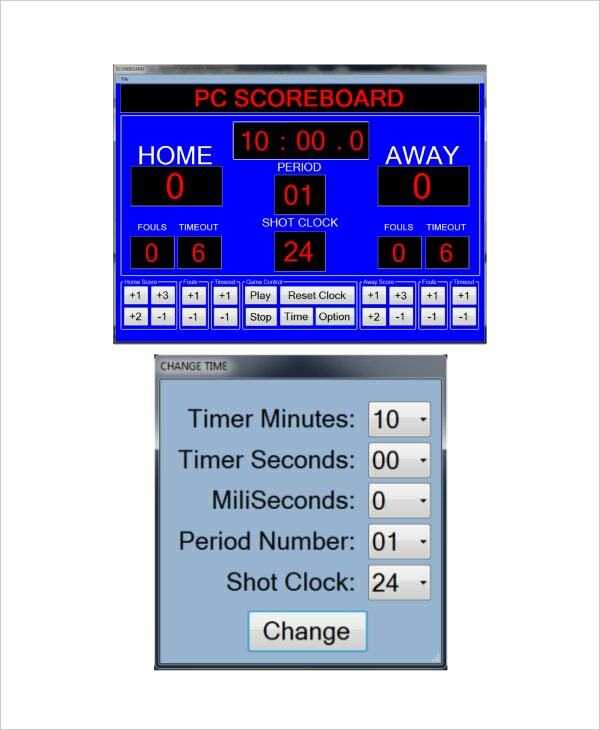 These Score Board Templates is widely used before, during and after the game is over to record, compare and contrast the statistics of the game with the previous matches. Examples may be viewed in which samples and formats are present. 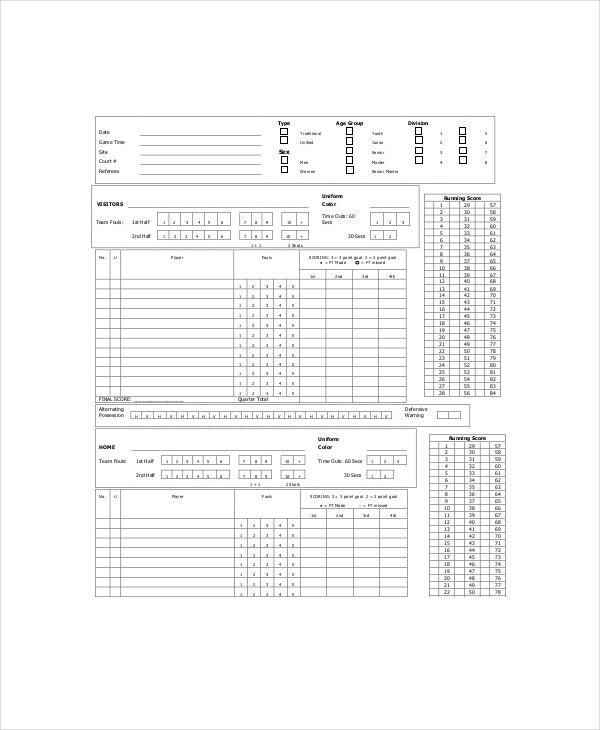 The traditional way has been to use this type of scorecard template to manage a game. It is in a printable format that is easy to use. All you need to do is fill it in with a pen and strategize the team performance and training wherever you are with ease. 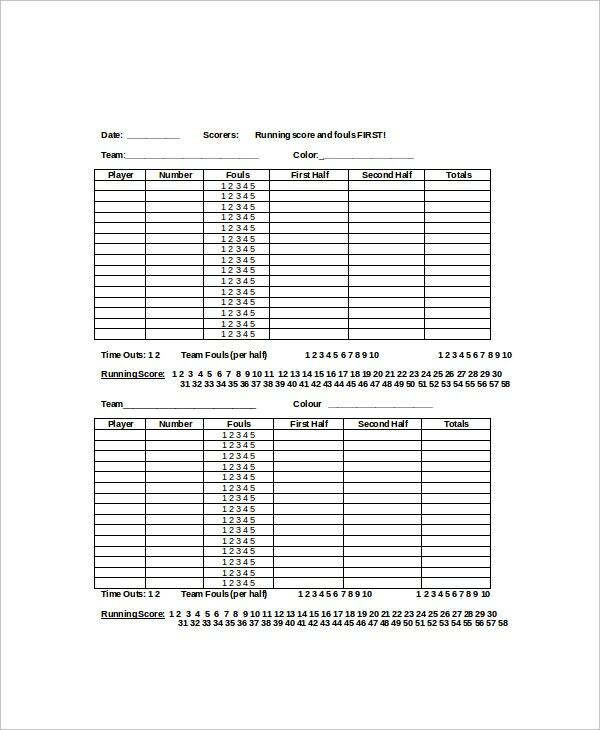 There are very useful basketball scorecard templates that can be used online without downloading. They are simple and can be used with any device from anywhere with all the convenience. It is only the final document that can be downloaded after finishing the strategy. Go paperless and still be efficient in your team’s performance. With an Excel file format scorecard template, the user only has to input the data and the formulas will calculate for you all that you need to implement. Making a game strategy can now be done much easily than ever imagined. Just download it and proceed to populate the tool with data for analysis and implementation. You can also see Scoreboard Templates. 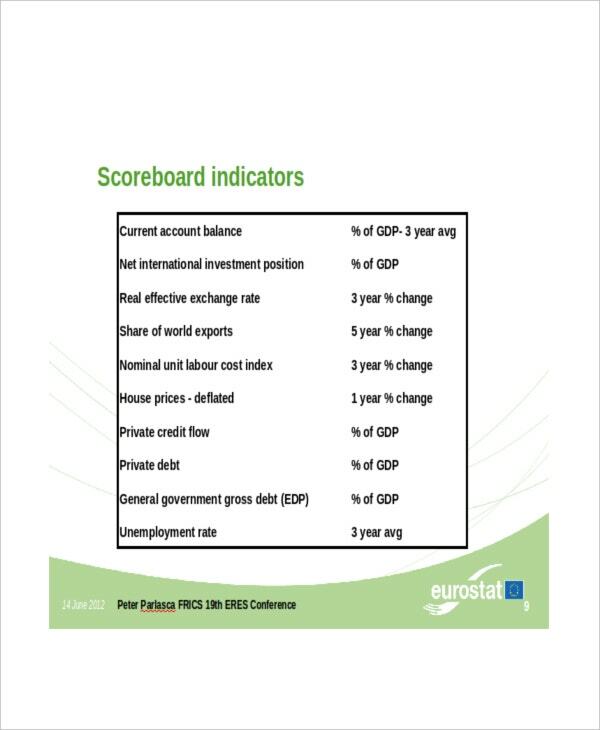 > In What Ways is this Scorecard Applied? 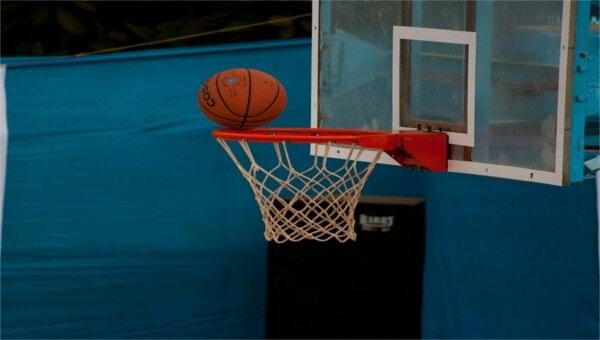 It has a number of applications with the major one being recording of cores during a basketball game. 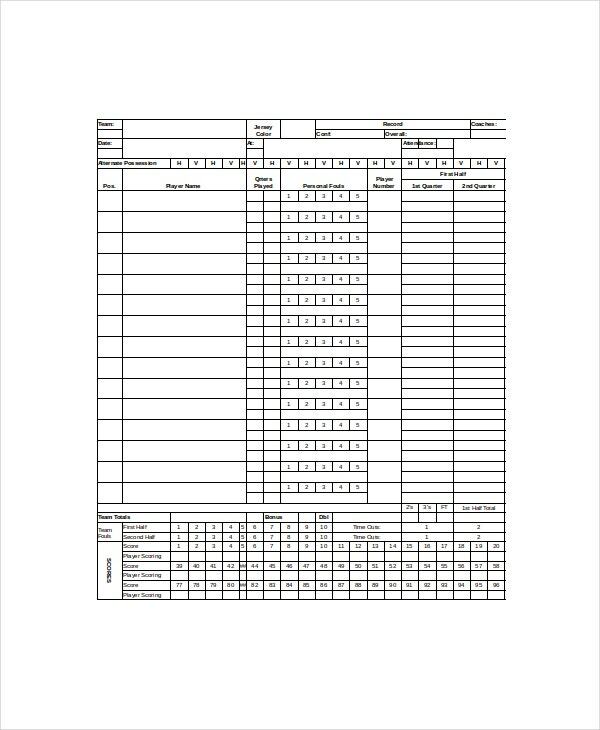 This scorecard template is designed in an easy to use format that requires little or no training on its use. It is a record that can be kept way after the match for reference purposes in case there is a dispute latter in the season. The team training can be made more effective using this template sample as it identifies the training needs and what each player can do better so as to maximize on their performance. With this template, the coach has his job made easier. > Who is This Template is Targeted at? The main target and user of this template format is the team coach and team managers who sue it to effectively manage the basketball players and oversee their training. It helps in planning and strategizing for the best performance of the team since the coach observes each player and fills the training and performance gaps in time. The other stakeholders like the team sponsor is also a beneficiary of this tool as it shows the levels of progress of every player and the team as a whole. The maximal use of the available resources is one main reason why the basketball scorecard template is important. Without strategically planning for a teams performance, it will just train aimlessly without knowing which areas to work more on. With this tool, the team members and the coach will know where they need to put more effort in comparison to previous matches performance. It helps identify specific weaknesses that should be worked on and to single out the team members that should be improved on the specific skills so as to make the team a perfect machine. It makes the team members motivated since they can also gauge their individual performances and see their rate of improvement over a period of time. You can also see Balanced Scorecard Templates. 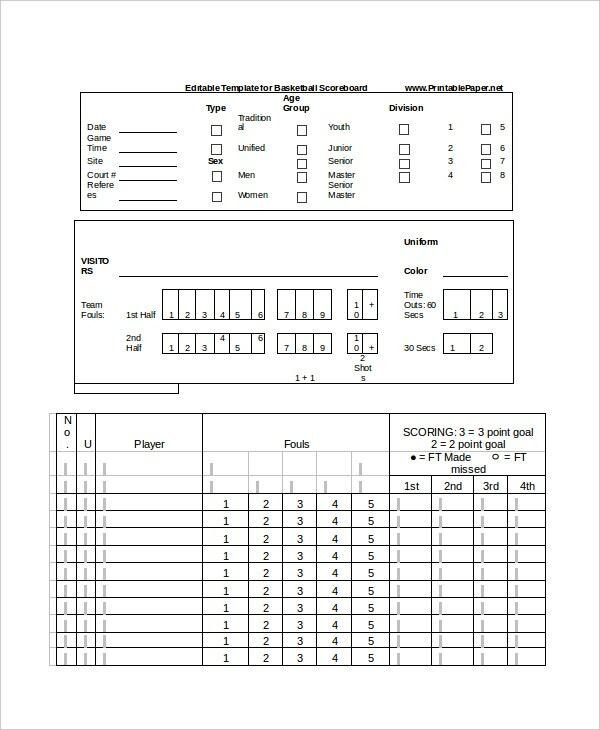 This basketball scorecard template format is one very important document that every team manager and coach should use in order to improve on the team performance. It also helps in improving the team morale as it shows measurable evidence of improvement. The efficiency in training methods also gets improved when this tool is applied.